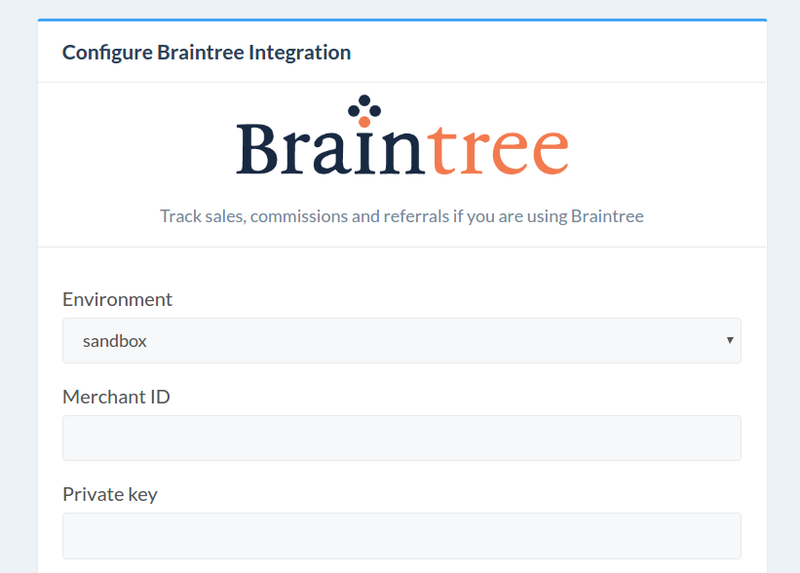 For added security, you can create a new User Role on Braintree that allows only read operations. You can skip to Step 2 if you are not concerned about this or you are in Braintree Sandbox environment. Now logout of Braintree and log back in as this new 'read only' user. Click on View Authorizations. Once you are on the API keys section, click on 'Generate API key'. On the new API key generated, click "View" in the Private Key column. Copy-paste the data from that table to corresponding fields on FirstPromoter Braintree Setup form. Click 'Check URL' to make sure you copy-pasted the destination url correctly. Once you created the webhook, go back to FirstPromoter and click 'Save'. If you don't get any errors it means that FirstPromoter was able to connect successfully to Braintree API. If you are using Braintree Sandbox Environment, you need to go back and repeat the steps for the Production environment. Important note: Because of Braintree Webhooks limitation, FirstPromoter can't automatically handle refunds, all other functions are working corectly. In case of a refund, you just need to "Deny" the commission/reward of the affiliate.